There are a few Yoshin Ryu training DVDs left, once gone they will be discontinued. Drop us an email for info. The history of Jujitsu is hard to describe, every book and web site as slightly different theories and stories. Try and understand where it all started in Japan. Jujitsu was the empty hand war art of the Samurais. Each Samurai family had their own style or group of techniques that were passed down to their household. They were not interested in writing techniques down for the public (or their adversaries) They would write family lineage, but not the interesting things that we are search for today. The introduction of mass produced firearms brought the Samurai era to an end. Family members would sell their techniques one at a time to interested people. In the late 1800's there were approximately 700 family crests or styles. This was also the time when creative individuals took techniques they wanted from Jujitsu and created "population friendly Arts, " like Judo, Aikido, etc. Techniques that were left were used for "self defense" and in the early 1900's generically referred to as "Jujitsu". TODAY the Federation believes it offers the closest translations to the original Yoshin Ryu Jujitsu techniques and the highest quality of Video Instruction available. Yoshin Ryu is an old "ancient" style of Jujitsu and is therefore considered "dead" by many martial arts historians. Martial Arts are usually passed down from Instructor to Instructor, traditionally family members. If there is a break and the art is not "passed" to an heir the linage is broken and the art is considered dead. This means that if you are intent on studying an Art that has a linage from the founding Head Instructor of that Art, you should dedicate your efforts of study towards the main line arts with an unbroken linage such as Danzan Ryu, Judo or Aikido, etc. However, Yoshin Ryu is interesting to research and practice because it was one of the main styles used by Dr. Kano in his creation of Judo. Professor Okazaki also used it in the creation of Danzan Ryu Jujitsu. Shihan Weymouth, Master Ellis and Master Moore, all who hold various Yudansha ranks and have different backgrounds in various other styles of Jujitsu and Judo, have been instrumental in studying, promoting and reviving this ancient art. Their work has been to achieve a "reenactment" of this ancient style through study, research and practice. Like any interpretations from ancient styles, there are discrepancies between different artist's interpretations of techniques. It is important to note that Weymouth, Ellis and Moore do not have any linage from Akiyama Shirobei Yoshitoki, or any of his dissentients or students, nor do they claim to be a final authority on the original techniques taught 4 centuries ago. It has always been the AFJ's goal to promote the arts and the different styles. 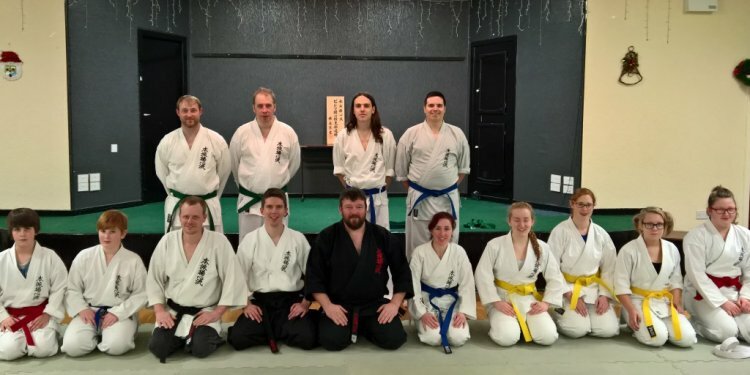 Yoshin Ryu is not considered the primary style of Jujitsu in the AFJ, it is simply the style Master Moore, the National Director of the AFJ, is actively researching and teaching at this time. It is important to remember that the AFJ is a round table of Styles and Instructors. Every style is held at the same level of respect because of the dedication of the Individual Instructors that continue to promote the Art of Jujitsu in general. This includes new Arts, Older Linage Arts and Ancient Arts. Please don't take offense if styles and systems don't match technique to technique. The basic principles and movements should be the common denominator in similar arts. Remember it is important to promote unity then cause division. No matter who you workout with, step on the mat and have fun! AFJ Instructors are welcome to host a web site with the History Information of the Art they Teach. The AFJ will link these history pages to the AFJ link page and title each page with the Heading that you like to appear.